Scion II is a vape tank that stays true to the original design while offering improvements in areas such as functionality, control, parts interchangeability, aesthetics, and airflow. The first improvement you'll notice with the Scion II is that the black Scion Delrin drip tip can now be swapped out for an Innokin wide bore acrylic drip tip, or even the drip tip you're currently using. This is to help you customize your tank to match your style. The Scion II fits drip tips from some of the most popular 24mm tanks and RDAs on the market. It is recommended to usehigh VG e-liquids like 70VG/30PG or 80VG/20PG. See our range of delicious cloud chasing e-liquids HERE. Changing the Scion coils is a relatively easy operation and is best performed with protective gloves to avoid getting nicotine onto you hands. Make sure the tank is empty before attempting to change the coil. Simply unscrew the top mouth-piece part of the tank and remove the glass case, unscrew the old plexus coil and screw in a new coil, make sure the new coil is firmly in place to ensure connectivity. Slide the glass case back into position and replace the mouth-piece, again ensuring it is firmly in place. 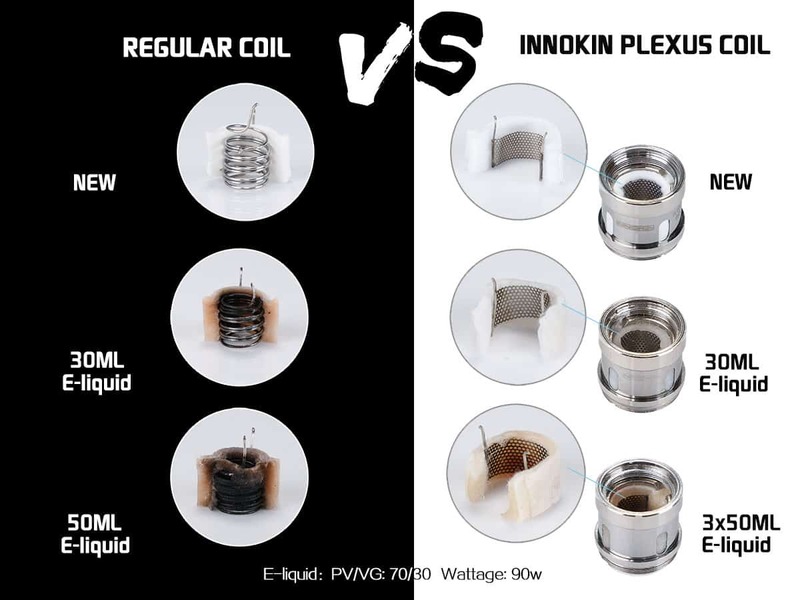 Scion coils come in the standard coil range but for added flavour and vapour use the Scion Plexus 0.15 Ohm coils.